Be the first to share your favorite memory, photo or story of Elton. This memorial page is dedicated for family, friends and future generations to celebrate the life of their loved one. Elton Harris Keene, 84, of Hopkinsville, Kentucky died at 8:55 a.m., Tuesday, March 26, 2019 at his home. Funeral services will be held at 12:00 p.m., Monday at Hughart, Beard & Giles Funeral Home with Jon Voss officiating. Burial with full military honors will follow at Kentucky Veterans Cemetery West. Visitation will be from 10:00 a.m. until the funeral hour at the funeral home on Monday. Hughart, Beard & Giles Funeral Home is in charge of arrangements. A native of Chatham, Virginia was born on October 15, 1934 the son of the late Morris Keene and Kate Custer Keene. He retired as a First Sergeant with the 101st Airborne as a Master Parachutist. 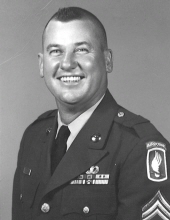 He served in Korea and Vietnam receiving the Bronze Star along with other meritorious and commendation medals. He was a member of Eagle Way Church of Christ. Survivors include his wife: Peggy Yvonne Keene of 65 years; his son, Mark (Natalie) Keene of Nolensville, TN; his daughter, Deborah (Joseph) Branham of Lexington, VA; his grandchildren, Elizabeth Amber Branham, Kaleb Keene and Lacey Keene. Memorials may be made to the Church of Christ Relief Effort, Nashville, TN. To plant a tree in memory of Elton Harris Keene, please visit our Tribute Store. "Email Address" would like to share the life celebration of Elton Harris Keene. Click on the "link" to go to share a favorite memory or leave a condolence message for the family.